When a relative had a stroke and suddenly became wheelchair-bound, access was needed for home care in three different family homes, including her own. I designed and built three simple wheelchair ramps. 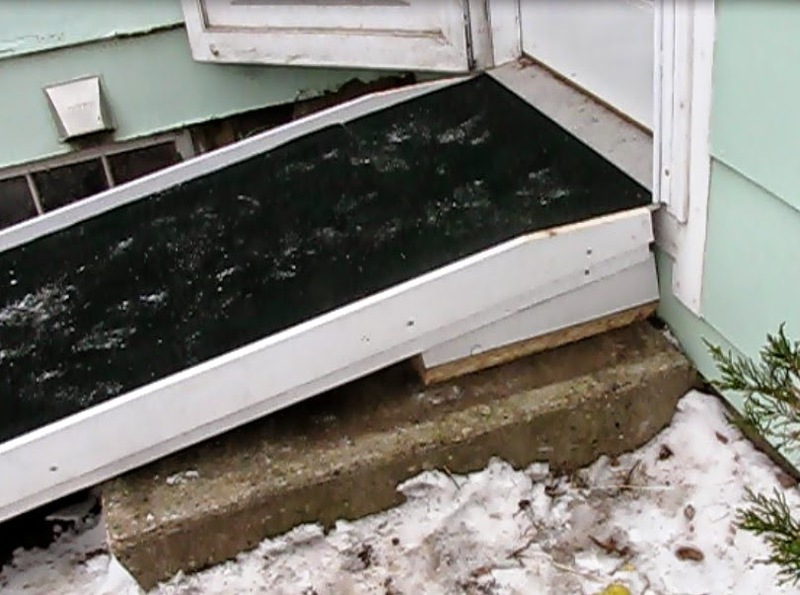 These ramps were made for access to homes with two step entries ranging from twelve to nearly eighteen inches high. There are two basic designs. Design one is eight feet long and covers steps up to 16 inches high. Here is the post for this lighter indoor ramp. Design two covers entrees up to 20 inches high. The longest ramp possible for the conditions is best. An eight foot ramp is easiest because plywood is readily available in four by eight foot sheets. A length greater than eight feet requires an additional length of plywood for the surface run. This post cover design 2, for a threshold over 16 inches high. The threshold is 17 5/8" high. This ramp is designed to rest freely on the step leading to the front porch of a home. The ramp, being longer, was made with five 2 X 4s (runners) spaced out for greater support underneath. To meet the minimum recommended slope for a household ramp, 12 inches of ramp for every 2 inches of rise, the ramp would need to be 8.8 feet long. As long as we need two sheets of plywood, I decided to make it ten feet long (since 2 by 4s come in that length) for a final pitch of 12:1.76. The two by fours are tapered to the ramp slope on the bottom and supported on the step at the top by five more tapered sections of 2 x 4s. Time to complete: One day for ramp building. 3-4 days for painting. 1 day for final assembly. 4) Calculate the angle of the leading edge with the ground. . While you can bevel this edge after the ramp is built, a better fitting leading edge will result if it is done now. We know two sides of the triangle. The ramp surface is 10 feet or 120 inches. The step height of 17.625 is the other side we know. We can find the angle with a little trigonometry. All we need is to find the sine of the opposite divided by hypotenuse: 17.625 divided by 120 = .1468. Then use the arc–sine function on a calculator or table to get the angle = 8.44 degrees. Another way to get it is to set up the ramp and use an angle finder. That is the pitch of the ramp and also the angle we will need on the underside of the leading edge. 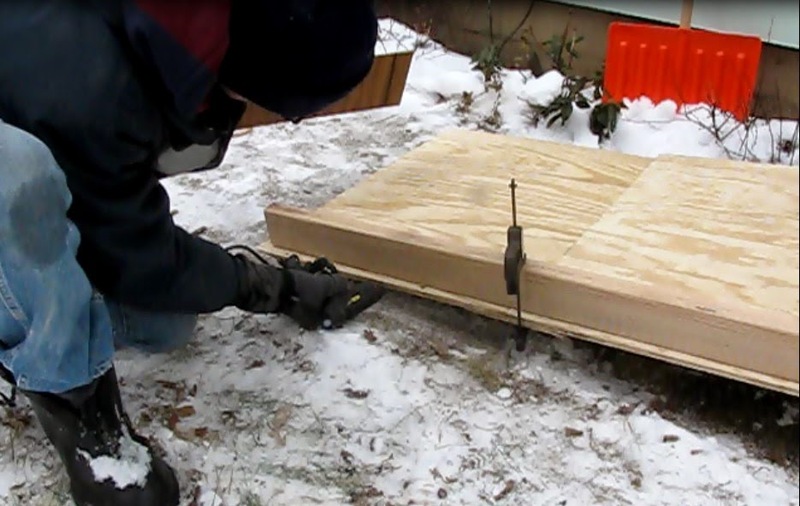 1) Cut the plywood to the ramp width of 31 inches. This will be in two pieces. One piece is two feet by 31 inches and the other 8 feet by 31 inches. Total length 10 feet. 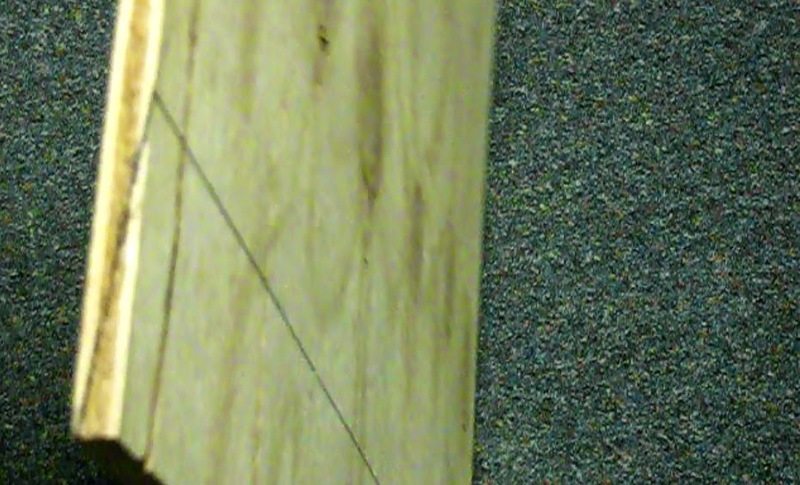 2) Transfer that calculated angle onto the leading edge of the plywood. On another ramp I did this at the end of the build, but for best accuracy it should be done now. Use a protractor to mark the 8.5 degree angle on both sides of the leading edge. Then make a line across the board where the lines come up. This will make it easier to tell when you have reached the angle. I chose to use the shorter piece for the leading edge, but the longer might actually be easier to handle later. 3) Remove material with belt sander or other to get the angle of 8.44 degrees. Be patient. This will take awhile. I have found no better way than a belt sander, although some material can be removed with a circular saw at maximum angle. 4) Reproduce the angle of the end of the runners with the ground. Clamp or temporarily screw the straightest 2 by 4 along the upper edge of the two surface plywood boards. Set the ramp down and prop into position at intended location. Set the upper end flush with the landing (or slightly below by the thickness of the finishing material, such as carpeting). Now warm up a glue gun and have a piece of squared up paneling or other thin board ready. Glue it to the lower edge of the ramp. When dry, turn the ramp on its side and mark where the paneling meets the underside of the ramp. Remove the paneling and cut carefully along the line. I used a jig saw. This is the template for the angle of the runners. 5) Cut the runners. Place the angled template piece on the end of a runner and mark the angle through to the end edge of the running. Make sure to line it up with the square with upper edge of the 2 by 4. It is best to start the cut with a hand saw at the end away from the leading edge of the ramp. Cut carefully with the saw of choice on the line. I’ve tried various saws and I always come back to a hand rip saw and a reciprocating saw (Sawzall). Save the small wedges left after the cut, as these will be used as part of the upper ramp support. 6) Optional but highly recommended. 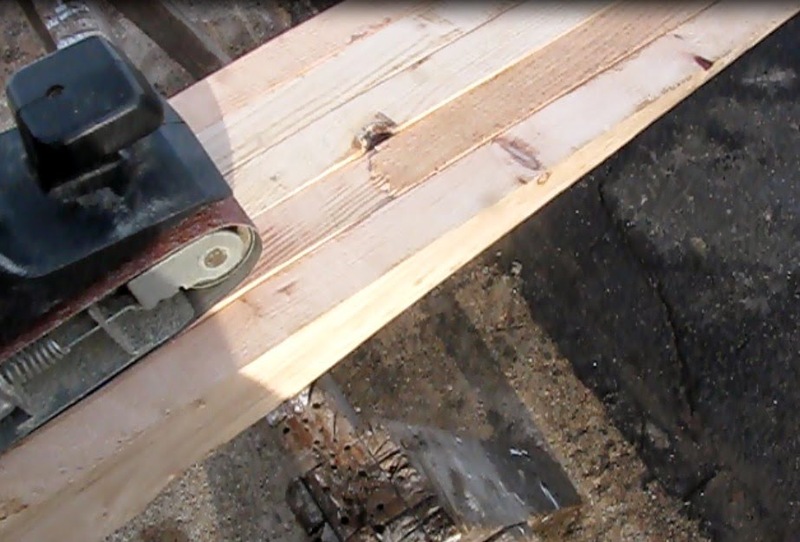 Test on location with the newly cut runner clamped to the plywood. It must be set up right to the threshold, approximating the final position of the ramp. If the angle of the cut is flush with the ground along the entire length, cut the other runners the same. If not, either modify by sanding or planning or cut a new runner. 7) Make all runners as close to identical as possible. Place them on a saw horses flush with each other and clamp them together. Now run the belt sander over the angled surface until they are all the same. Do not alter the basic angle. Repeat this process for the top under-wedges. Important! Sand the runners to get them as close to identical as possible. 8) Paint all materials if the ramp will be used outdoors. Two coats of house paint on all pieces took four 45 minute sessions over three days. 1) Find a good clean, dry (and hopefully warm) place. Set the plywood surface side down. Now place the ground side of the runners facing up on the plywood. Space them out evenly. I find measuring from the inside edge of each outside runner and then dividing by four worked well for a five runner ramp. I got 29.5”, which put the runners 7 3/8” apart center to center. Align the leading edge of the runner by placing a straight edge on it and adjust the position until it is flush with the front of the ramp. Do each runner and mark the final positions. 2) If necessary, trim the upper end of the runners. On the threshold end of the ramp the two by fours should be at least half an inch short of the ramp surface. If they are too long, the angle of the ramp will cause them to contact the vertical face of the step below the threshold and leave an unwanted gap. Trim as necessary. 3) Install braces between the runners. Measure and cut pieces of 2 by 4 to fit between the lower and far upper end of the ramp. There will be eight needed on a 5- runner ramp. Stagger them. The top ones should be 4-6 inches from the upper end of the ramp. They will be used to attach the board holding the upper leveling wedges. I find it easiest to use a foot long metal ruler with a sliding t-square to set the gap between the runners and then transfer it the two by four for cutting. Fasten with 2 1/2 inch long deck screws. Four screws will be needed on each brace for a total of 32. Add the additional four braces at the bottom end of the ramp, four or five inches from where the angled cut begins on the runners. 4) Turn over the runner assembly and place the plywood into position, using the marks made earlier. 5) Attach with deck screws of choice. I like square headed ones for ease of driving straight in a drill. You don’t need to go nuts here with many long screws. 6) If desired this is a nice time to test the ramp evenness squareness. Prop up the upper end on wood or concrete blocks so the upper end is at the correct height. Make sure all the runners are flush and even and the ramp doesn’t rock. Adjust any runners now, if necessary. 7) Add outdoor carpeting if desired. I like it for appearance and traction. I stapled it in place. 8) Add the side rails. I used two 1X4X10s. They will need to be trimmed at the lower edge for sure and possibly the upper as well, if there is an opening out screen door. An inch and half makes a good ramp rail height. Set the board in place at that height above the ramp surface and trace the angle to match the leading ramp edge. Cut with a recip or other saw. 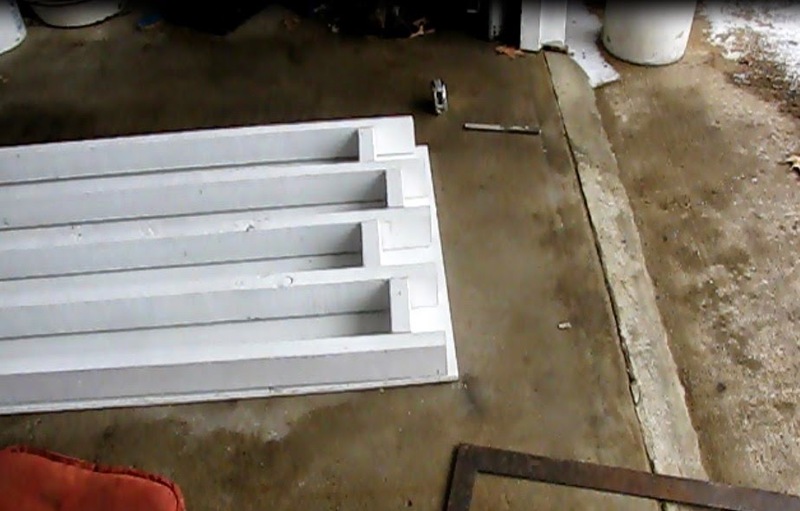 1) Test how the upper wedge support wedge support will fit on the step. Position the two outside small wedges with the board on top on the step. Put the ramp in position on it and see how it will fit. The board must be quite near the upper end of the ramp when the at the intended site. 2) Build the upper ramp base. 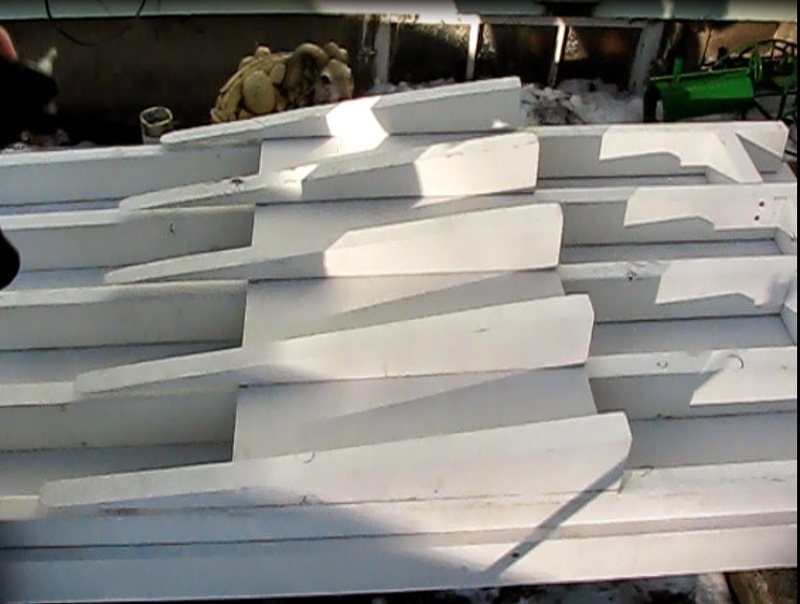 This consists of the small wedges remaining when the runner angles were first cut and a piece of plywood cut to the ramp width and about 15 inches long. With the ramp upside down, set the wedges on the runners and lay the plywood on top. With the little wedges lined up with the leading edge of the plywood, screw them in. Two screws on each is plenty. 4) Now set the base, runner side down, on the step. Turn the ramp over and place in final position. The base needs to be close to the leading edge of the ramp. If it is short of the door threshold, measure the distance short and add boards or other material to bring it up. I added 1 3/8” worth of plywood. When it is in position at the threshold, mark the position with a line through the base and ramp. 5) Turn the ramp over, align the marks made previously and screw the base into the four braces that were installed earlier. One screw each is plenty. Turn it back over and check. If good, well done. If possible cover with a tarp during rain and especially snow. This is great post.I like this post. Many many thanks for this post.Really this post is so helpful. You're welcome and thanks for the comment. I built three of these and they work good for our disabled relative. I have read your. thank's for advice. Informative and interesting which we share with you so i think so it is very useful and knowledgeable. I would like to thank you for the efforts. I am tiring the same best work from me in the future as well. Thanks for share helpful information. These bigger sanding belts provide larger working surface spot on your resources, nevertheless they likewise are usually more tough to regulate. While most people were watching the summer Olympics, the Perry family had their own feat to overcome as they worked on a new construction project in their backyard. Read the story and see the photos of their new deck and pergola as it comes to completion. I think that was a really nice project! I wish I had thought about this when my son was still small and using a pram! I guess that's another use for it. I use mine to help my mother-in-law into the house, three houses actually.